This recipe starts with a basic shortcrust. I added some cocoa in with the flour mixture, and substituted the butter for a soy spread. I’ve seen a few olive oil shortcrust pastry recipes around, so you could use that, too. You simply pulse the ingredients in a food processor until its all crumbled up, then add a little water and pulse until it all comes together. 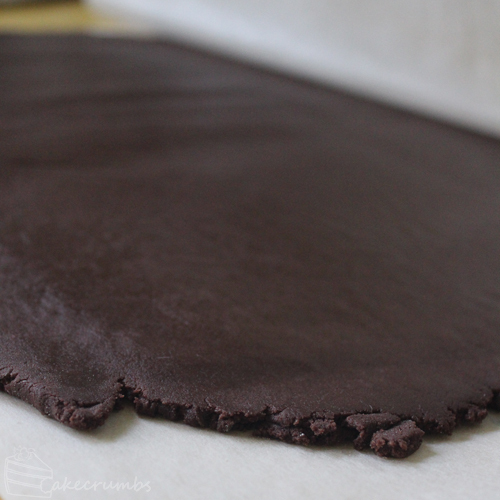 I rolled it out between two sheets of baking paper to get it nice and thin, then chilled it in the fridge for a bit. 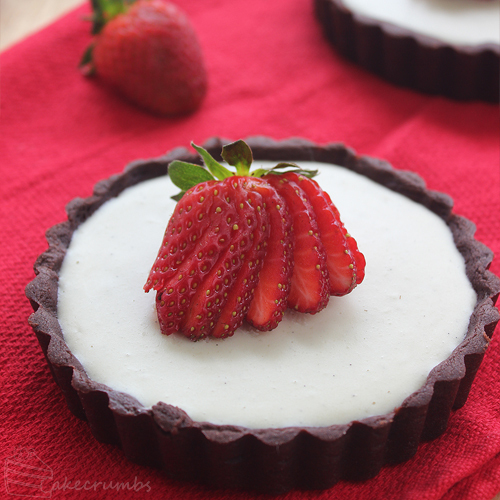 I used these mini tart tins for the recipe. The shell is the only baked part, so you can alter the baking time based on how large you want the tartlets to be. You could even make it into one tart if you prefer. 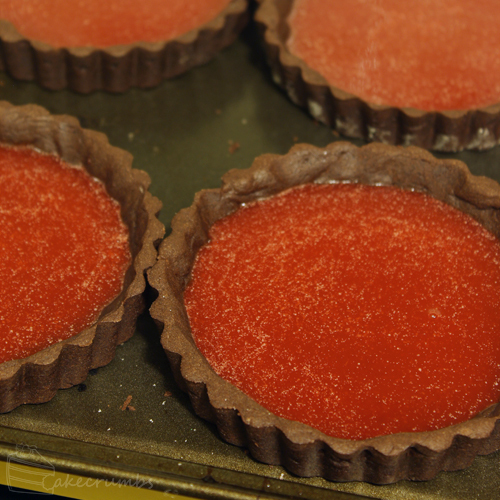 After they baked I turned to making the first layer of the tart: a fresh strawberry jelly. I hulled the strawberries and processed them until they were well and truly mushed up. Then I strained them through a fine mesh sieve to get rid of the seeds. That’s mostly personal preference — I prefer it without the seeds both texturally and aesthetically. Now comes the fun bit: playing with agar agar. A lot of people who’ve never had to think about it don’t realise gelatine is an animal product. Agar agar is an alternative setting agent. It’s derived from seaweed, making it friendly for a lot of dietary requirements. But it also has a lot of fantastic properties that gelatine doesn’t. It sets at room temperature, and it sets quickly. We’re talking a matter of minutes here. The moment your mixture cools to 40°c, agar agar will set. This high setting temperature means it takes more to melt. It doesn’t go grainy if it’s heated to boiling as gelatine does, and mixtures set with agar agar can be reheated and re-set without a problem. Anyone who’s made gelatine-based jellies will know how the jelly will tear when it’s cut or moved. Jellies set with agar agar can be piped and they won’t break up all over the place. And anyone who has done science at a tertiary level will probably also be familiar with the agar plates used as a medium for culture growth: it’s the same stuff! It has such a massive range of applications, both within and outside of culinary arts. Agar agar powder can be substituted 1:1 with gelatine powder in most cases. However it does have a firmer set than gelatine, so you need to be careful of using too much. The only disadvantage of agar agar is if you’re trying to set anything with wine vinegar or really acidic foods, as it often won’t set. For everything else, it’s great! 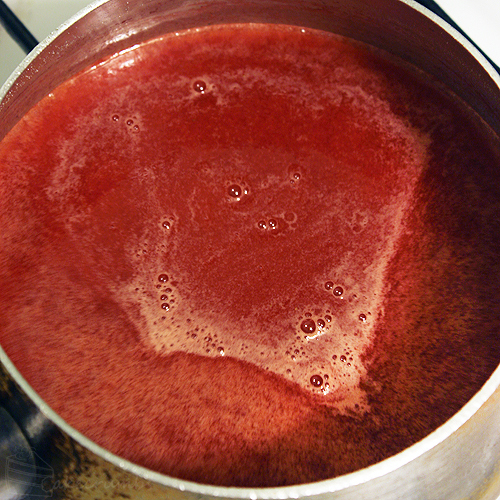 For the jelly you simply whisk the powder in with the sugar, pour in the strawberry puree and boil until it gets hot enough to melt the agar agar. Then you pour enough to fill the cases half way, and wait for it to set. It’s insane how quickly it turns from steaming liquid into a perfectly set jelly. While the agar agar is doing its thing, we can move onto the the white chocolate mousse. I basically stuck to my normal mousse recipe, but subbed all the dairy for non-dairy alternatives. In place of milk I used almond milk. I boiled that with the agar agar first. I’ve read a lot that it’s often easier to make your own vegan white chocolate than to buy it. I’m not sure if I’m just fortunate, but I found a vegan white chocolate right in my supermarket. Didn’t even need to find a health food store. For my fellow Australian readers, Woolies stocks the Sweet Williams range of chocolate. Their white chocolate is sold in 100g blocks amongst all the other chocolates so it’s really easy to find. The boiling milk is poured over the chopped up chocolate, then you’ll stir it until it’s all smooth and melted. Meantime, you need to whip the cream. There are apparently a lot of whip-able non-dairy (e.g. soy) creams available. I instead opted for coconut cream. If you stand coconut cream in the fridge overnight, you can separate out the coconut water leaving you with a whip-able cream. This of course gives the mousse a coconutty flavour, but we’re all coconut lovers so I was very on board with this. If you prefer not to have this flavour element, you can head for the soy stuff instead. This has to be quickly folded through the chocolate mixture before it cools enough to set. 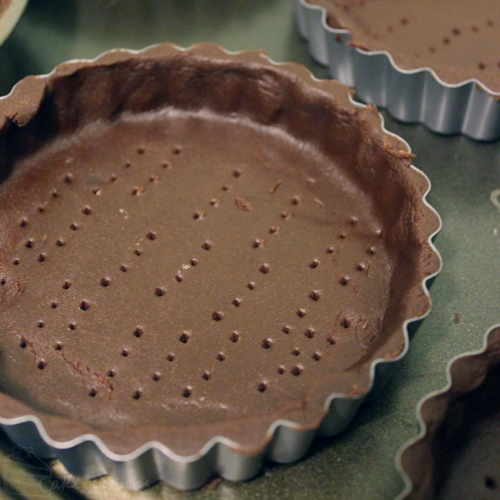 Then you can fill up your tartlet cases with the mousse. I adorned them all with sliced strawberries right before serving. The almond milk and the vegan chocolate gave the mixture a very yellowy appearance, but the addition of the coconut cream makes the mousse such a vibrant white. Much brighter than the dairy version of this mousse. I flavoured it with vanilla bean, so there little flecks of the vanilla seeds through it make it a really attractive mousse. 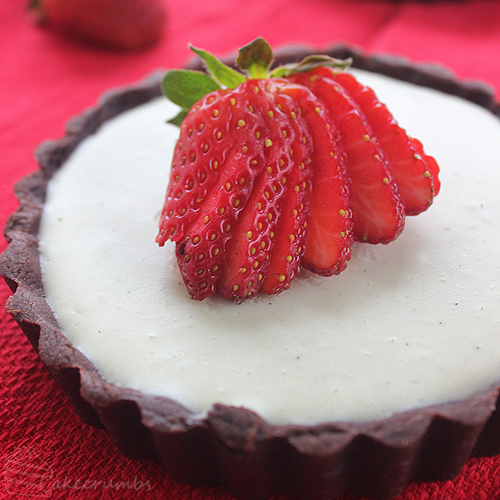 The tart was absolutely a hit with everyone, vegan and non-vegan alike, which bodes well for more experimentation next time. The following recipe will give you both the vegan [v] and non-vegan [nv] ingredient alternatives where relevant. If you are making this for someone who can’t have animal dairy then be careful to use only the animal dairy free ingredients. Otherwise feel free to swap and change between either based on your desired taste outcome. Note: if you are using the coconut cream, let it stand in the fridge for a day before opening. This will make sure the coconut cream separates from the water content in the can. 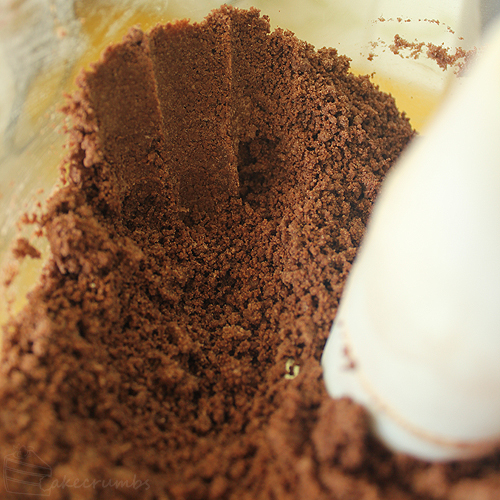 Place flour, sugar, cocoa powder and soy spread (or butter) in a food processor; gradually pulse until mixture resembles fine breadcrumbs. Add 1tbsp of the water. Pulse until liquid is just combined. Test the dough by pressing a portion between your fingertips; if it adheres to itself it’s ready. If it’s dry, pulse in some more water a few drops at a time until dough is moist enough. Preheat oven to 180°C (160°C fan-forced/355°F). Line pastry with baking paper and fill with pie weights or raw rice. Bake for 10 minutes; remove paper and weights and bake for a further 6 minutes. Allow to cool completely. 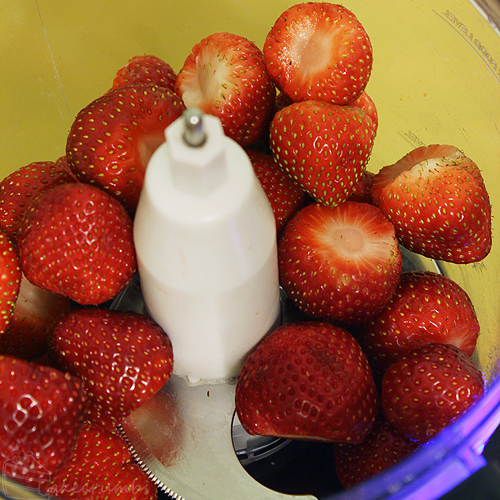 Blend the strawberries in a food processor until pureed. Strain through a fine mesh sieve, discard seeds. 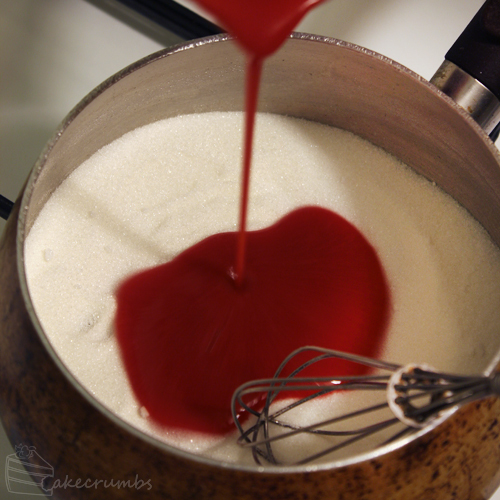 In a medium heavy-based saucepan, whisk together the sugar and agar agar powder. 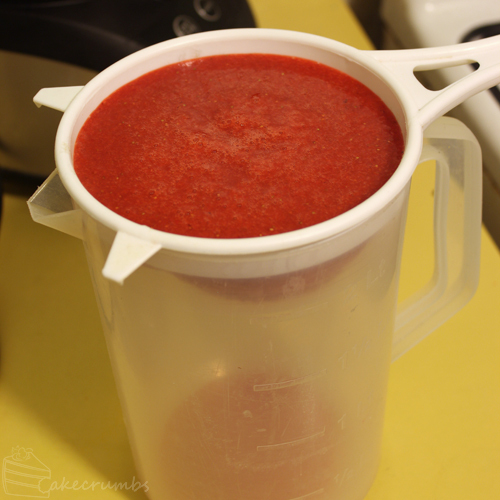 Pour in the strawberry puree and lemon juice. Stir over medium heat until sugar dissolves. bring to the boil. Once boiled, remove from heat and pour jelly into the tartlet cases. Leave to set at room temperature. 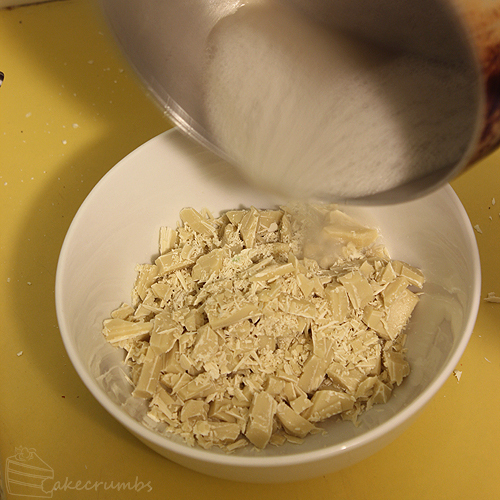 Chop up the white chocolate and set it aside in a bowl. If using coconut cream, pour the topmost layer of coconut cream into a bowl making sure the bottom layer of coconut water does not mix in. 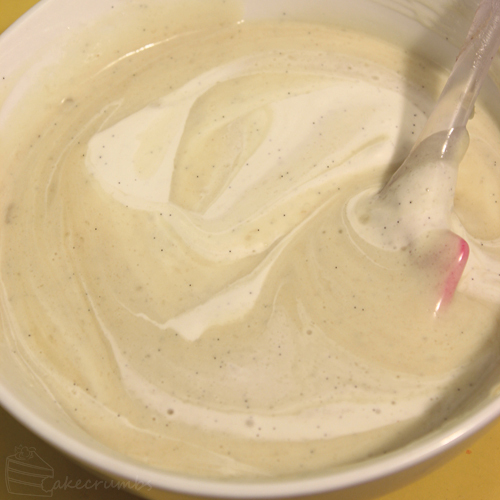 If too much of the water mixes with the cream it won’t whip properly. You can keep the coconut water for a smoothie. 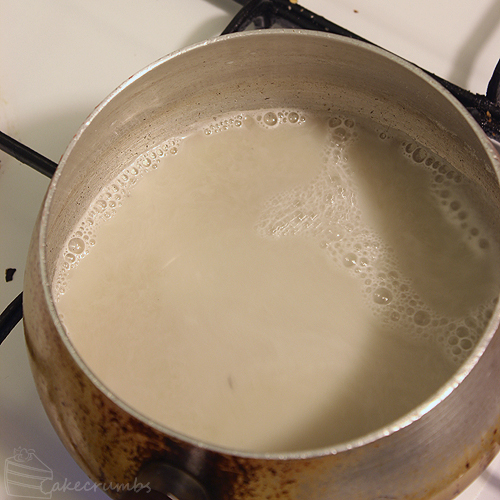 In a small, heavy-based saucepan, heat the milk and the agar agar powder together until the mixture boils. Meantime, combine the vanilla bean paste and icing sugar with the cream in a medium bowl and whip to soft peaks. Once the milk has boiled, pour it over the chocolate and stir until chocolate melts and is well combined. Working quickly, fold the cream through the chocolate mixture a third at a time. 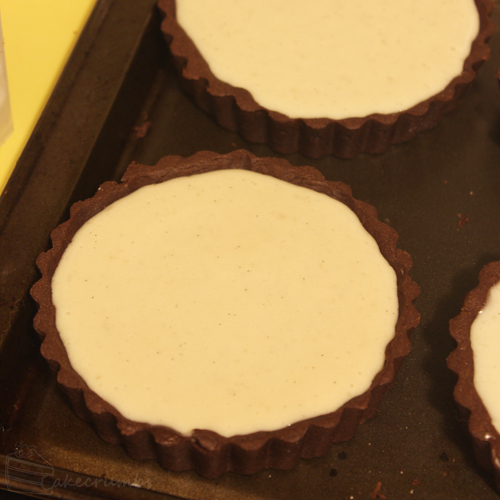 Fill the tart cases with the mousse and allow to set at room temperature. Once set the tart can be served. Adorn with sliced strawberries or a garnish of you preference. I’ve only done it twice and have had it work both times so I haven’t really had to troubleshoot. But getting as much of the water out of the cream is essential. I think I read somewhere that you need to use full fat cream but I might be confusing that memory in my head. Ok, I’ll just give it another go. Maybe its the brand I’m using. I’ve heard some will whip and some won’t. Oh, so pretty! My tartlet pans arrived from Amazon yesterday – sounds like a good time to try this recipe. Oh exciting! Tartlet pans are so much fun. everything just seems better when it’s smaller, individual serves. I’m writing from Barcelona, just to say thanks for sharing this great recipe! This weekend I used the whit chocolate mouse for a big cake for my family, and it was just delicious. I’m so glad you all liked it! Thank you for your lovely comment. 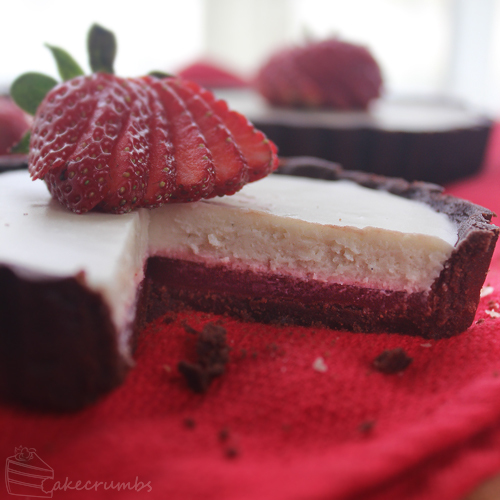 I have made these beautiful tartlets yesterday and they turned out great! The dough, strawberry yelly and chocolate mousse taste great and the whole making process went very smooth 🙂 Thank you so much for this wonderful recipe and your wonderful website!